A couple of days before Easter we still had no idea what to make for our dinner, all we knew is that we would be cooking something together. We ended up with two recipes that are already in the blog: a rack of lamb with cranberry reduction sauce, and a mushroom soufflé. 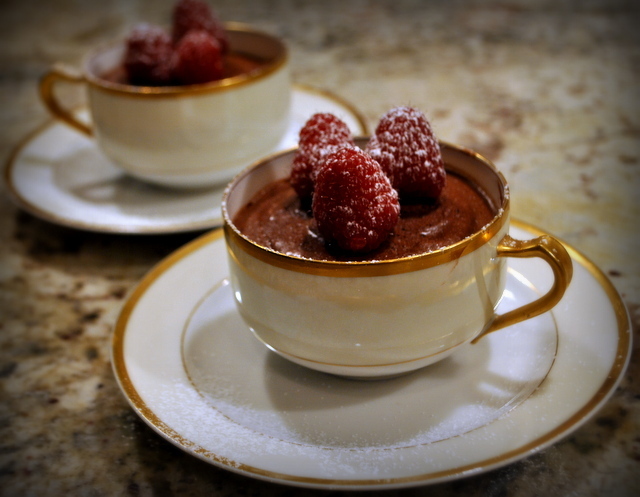 We rarely make dessert for just the two of us, so at first we considered skipping it altogether. Then Phil mentioned that there was one particular dessert he had only enjoyed a few times, always in restaurants and maybe I could try and make it for us. 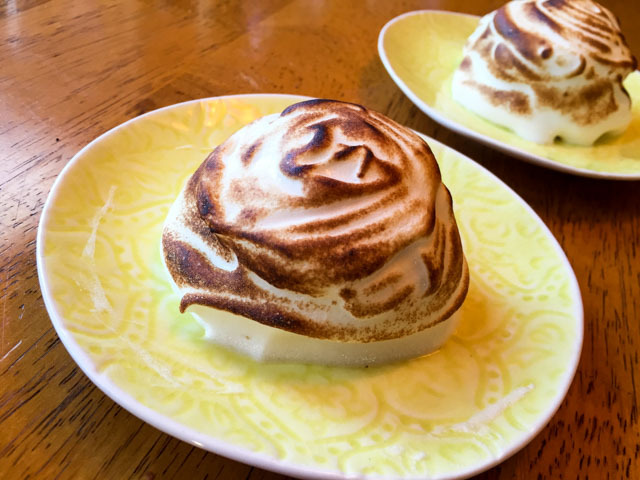 He added “it may be a bit involved, though.” Visions of a six-layer coconut cake flashed in my imagination, but he definitely had something quite unexpected in mind: Baked Alaska! My gosh, the last time I had it I was a teenager in Brazil, so that’s a little more than five years ago (wink, wink)… We had this conversation 24 hours before Easter dinner, so I felt a rush of adrenaline pumping in my veins, and went to work. 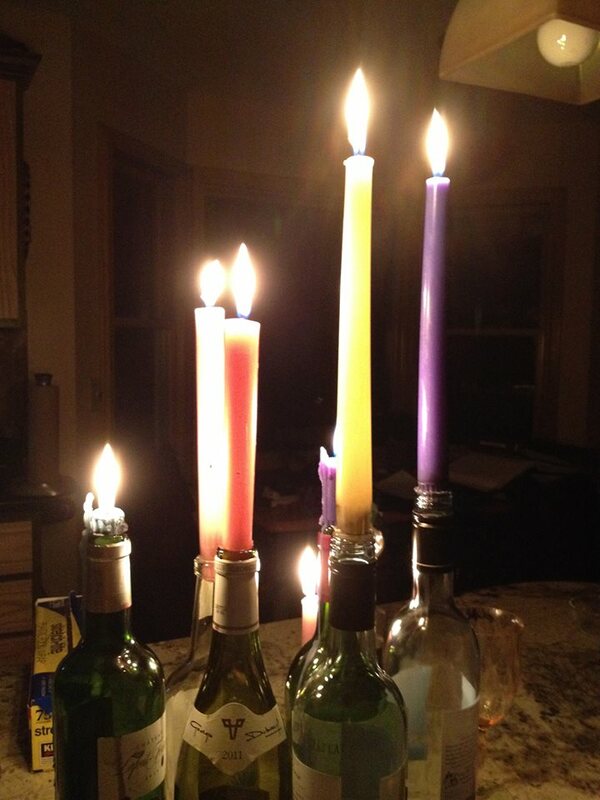 By work I mean “furiously googling.” I found the perfect recipe in a blog called “Dessert for Two.” How appropriate! 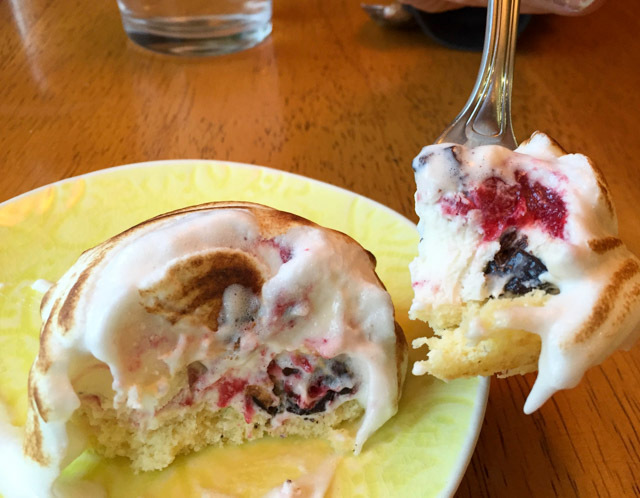 It’s a great blog, by the way, make sure to visit… It goes without saying that Baked Alaska doesn’t keep very well, so making a small batch just for the occasion was a must. This was super fun to make and I must say one of the most delicious sweets made in our kitchen. You could of course double or triple the recipe, keeping the amount of meringue unchanged (it made more than needed for two small servings). Use a 9 x 5″ metal bread loaf pan for this recipe; it needs to have sharp corners. Do not use ceramic bakeware with rounded corners. Line the bottom of the pan with parchment paper. Trim it very well to fit perfectly. Do not grease the pan in any way. In a medium bowl, sift together the flour, baking powder, and cornstarch twice. Fold one-third of the flour mixture into the eggs. Take your time and do this carefully until all of the flour mixture is incorporated, adding 1/3 of the flour mixture at a time. Finally, stir in the hot milk and butter mixture all at once and fold in well. Pour the batter into the pan, and bake for 10-12 minutes, or until a toothpick inserted in the center comes out clean. Remove the pan from the oven, and let cool for 10 minutes. Then, run a knife along the edges of the pan and invert the cake carefully onto a cooling rack. Gently peel the parchment paper off, but if any more than a thin layer of cake sticks to it, let it cool completely before pulling it off. 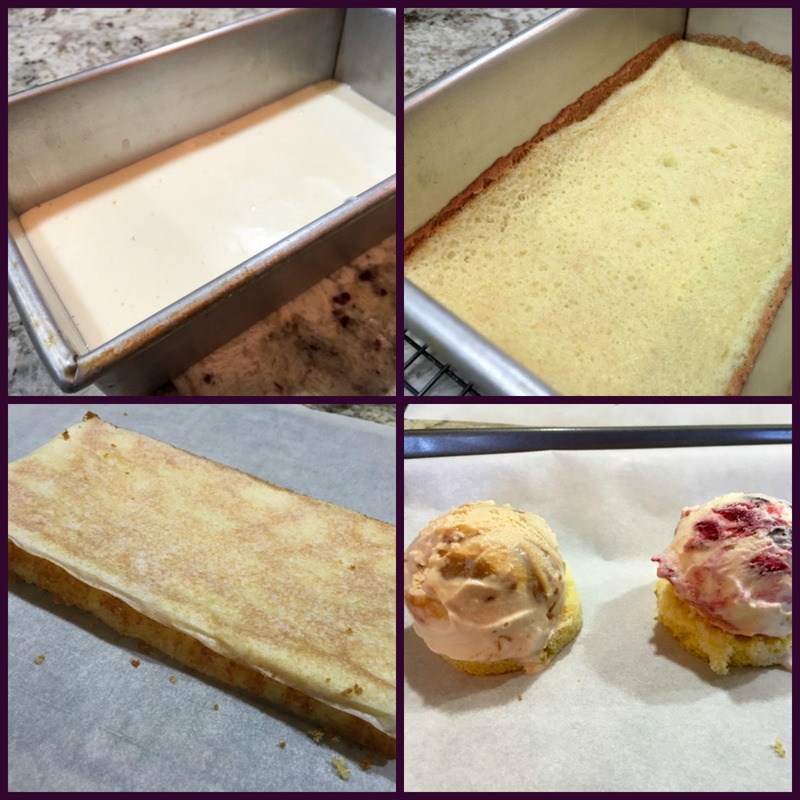 You can make the sponge cake the day before. Scoop two perfect spheres of the sorbet by using an ice cream scoop. Level off the surface of the sorbet with the scoop to make a flat bottom. Move the sorbet scoops to cupcake liners (or parchment paper) and freeze until very firm. To assemble, use the edges of your ice cream scoop to cut out perfect-sized rounds of sponge cake. Top each cake round with one of the sorbet scoops. Place back in the freezer. Next, whip the egg whites in a medium bowl on high-speed until soft peaks start to form. Stream in the sugar and beat until combined. Don’t beat the egg whites past the point of soft peaks. 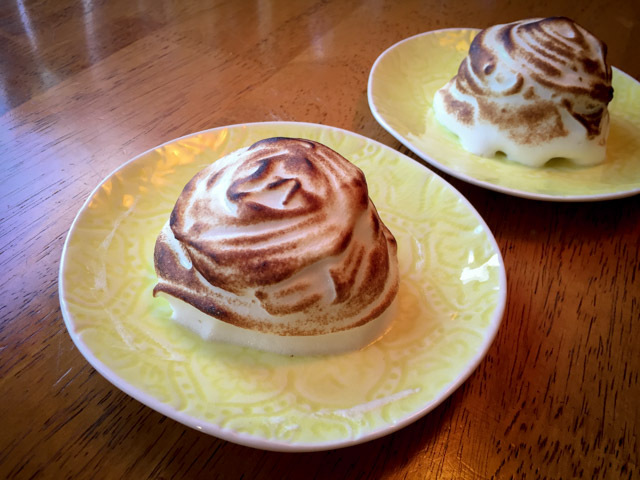 When ready to serve, pipe the egg whites (or use a spoon) over the sorbet mounds. Use a fork to make ridges in the egg whites. Using a culinary torch, brûlée the egg whites and serve the dessert immediately. Comments: I never imagined I would re-visit a cake that is pretty much like a genoise, my nemesis. And, to make matters worse, this one was baked in a tiny loaf pan. But, I must say it all went flawlessly, which worries me a little. Next time I bake a cake, I will pay my dues to the universe, obviously. I wish I had more pictures of the whole process, including the drawing of circles in parchment paper to cut the base, but things were a bit frantic as they always are when I’m around cake batter. ONE YEAR AGO: Cauliflower Tortillas: Going low-carb and loving it!